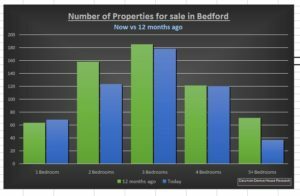 Bedford Property Blog | Bedford Property Market :84% of Bedford Properties have 3 or more bedrooms – Problem or Opportunity? Bedford Property Market :84% of Bedford Properties have 3 or more bedrooms – Problem or Opportunity? The orthodox way of classifying property in the UK is to look at the number of bedrooms rather than its size in square metres (although now we are leaving the EU – I wonder if we can go back to feet and inches?). It seems that homeowners and tenants are happy to pay for more space. It’s quite obvious, the more bedrooms a house or apartment has, the bigger it is likely to be. The reason being not only the actual additional bedroom space, but the properties with more bedrooms tend to have larger / more reception (living) rooms. However, if you think about it, this isn’t so astonishing given that properties with more bedrooms would typically accommodate more people and therefore require larger reception rooms. In today’s Bedford property market, the Bedford homeowners and Bedford landlords I talk to are always asking me which attributes and features are likely to make their property comparatively more attractive and which ones may detract from the price. Over time, buyers’ and tenants’ wants and needs have changed. In Bedford, location is still the No. 1 factor affecting the value of property, and a property in the best neighbourhoods, say Salph End or Harrowden can command a price nearly 50% higher than a similar house in an ‘average’ area. However, after location, the next characteristic that has a significant influence on the desirability, and thus price, of property is the number of bedrooms and the type (i.e. Detached/ Semi/Terraced/Flat).